I was in school when the three-wheeled vehicles first started to drive on the roads of Sri Lanka. The blue, green, red and cream coloured taxies slowly started to accumulate on the road tops often next to the bus stand. They were called ‘three-wheelers’ or simply ‘three-wheels’ or somewhat derogatory ‘trishaws’ (derived from rickshaw) for a long time. Do you remember how the importers ran advertisements trying to call the vehicle by the main manufacturer’s name as a competitive strategy? It didn’t stick in the market. During the past decade tourists brought the term ‘tuk-tuk’ from Thailand, which was contemptuously picked by the English-speaking elitists in Colombo who just love to pick anything foreign especially if it is spoken by a white-skinned person. Three-wheeled vehicles and their drivers who drive them both for hire and for their personal use have become the blame points for so many issues in the society. It’s a convenient icebreaker and any discussion on any problem in this country seems to end with three-wheeled taxi drivers. Sri Lanka certainly has labour force problems. But you can’t solve them by blaming the three-wheeled taxi drivers. If you really want to blame someone then blame the UN for successfully controlling Sri Lanka’s population growth thereby deliberately creating this problem in the first place. In fact, I think three-wheeled taxi drivers are probably the most productive labour force in our country. They provide a critical public service by fulfilling the travel and transportation needs of millions of people all year round, from any one point to another point at a very reasonable price. I mean they are way more productive than the inherently unproductive public sector employees to start with. And it must be really easy for those private sector employees to criticise the three-wheeled taxi drivers from their air-conditioned offices warming seats on their brains for long hours. And those employers who are nagging about not having enough people to work in their factories because all the productive-aged youth are supposedly driving three-wheeled taxies for fun, should ask themselves, ‘Why do these young people prefer to drive a three-wheeled vehicle for a living?’ Could it be that you are not paying them enough? Could it be that they despise your 20th Century employer-employee relations? Could it be that your jobs are so awfully boring? Maybe you need to change to meet the 21st Century workforce. Increased numbers of three-wheeled vehicles do cause traffic. But so do four-wheeled vehicles. There are many undisciplined three-wheeled vehicle drivers. But there are many undisciplined drivers on four wheels as well. You don’t have a moral right to discriminate the city traffic based on the number of wheels you are on. In fact, for the narrow roads, bumpy roads and no-roads in this country, the most appropriate vehicles are smaller vehicles. Like three-wheeled vehicles for example. The Government should first provide a good public mass transport system for the people before downplaying three-wheeled vehicles. They are doing the Government a huge favour by providing an essential public service. Their service should actually be recognised and specially compensated by the Government. It was a good move to start promoting electric three-wheeled vehicles by the Government in partnership with Japan. That’s progress. That’s futuristic. That’s ‘sector-building’. Although the prototype looks terrible I’m sure it will evolve. If we can gradually convert all three-wheeled vehicles to electric motor power with a battery swap system, that’s a huge win for carbon emissions control, provided the electricity is generated through renewable sources. It’s ridiculous how some people ask to bring dignity of labour in Sri Lanka and then in the same conversation refer to three-wheeled taxi drivers as three-wheel ‘Kaaraya’ or a ‘tuk-tuk guy’. The three-wheeled vehicle is somehow seen as an inferior mode of transport just because it has three wheels. Three-wheeled taxi driver is treated socially as the modern version of the rickshaw puller. We need to stop that right now. We talk about adding value to our tea, rice, fruits and vegetables but why can’t we add value to the three-wheeled vehicle sector? Why can’t we constantly innovate the design, safety and efficiency? Why can’t we paint them to look like professional taxies? Why can’t we train and upskill the three-wheeled taxi drivers to be excellent drivers, respectful customer service agents, social and environmental vigilantes and ambassadors of goodwill. Very soon cities like Colombo, Kandy, Kurunegala and Matara will have to control the number of vehicles driving into the city centre. 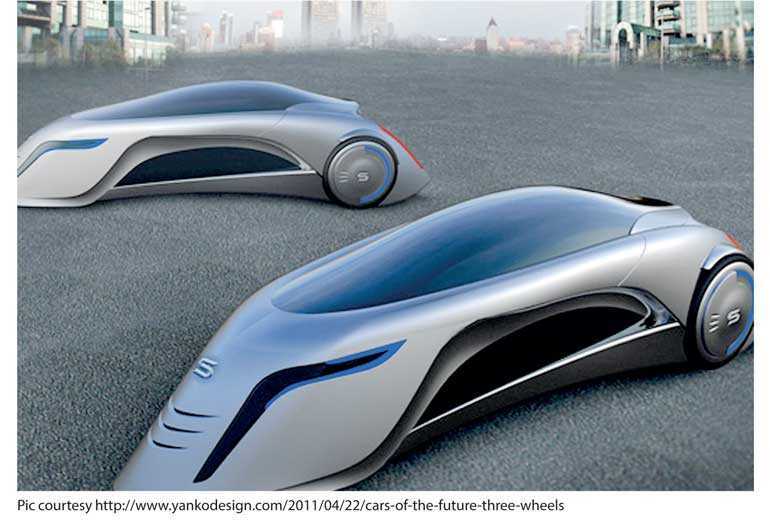 The future transportation is light-weight, modular and electric. Given that our governments have no brave vision or will to make that future happen, let us – the ordinary citizens and social entrepreneurs - take the lead. Here’s a challenge to the product designers, design schools, engineers, inventors and innovators: can you redesign the three-wheeled vehicle to meet our future transport needs? While the University of Moratuwa students try to make yet another supercar every year, can you also please work on real local problems like improving the safety of three-wheeled vehicles? And as passengers, let us dignify the three-wheeled taxi and its driver.